Happy hump day!!!!! A CVS run for Aleve birthed this beauty, Show Me the Money by Spoiled. 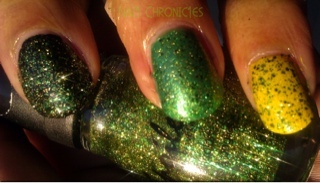 Show Me the Money is packed with fine green and gold glitter in a light yellow tinted base. 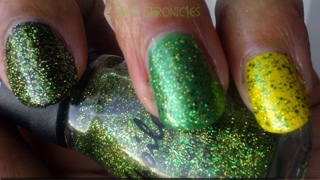 This is 3 coats Show My the Money. 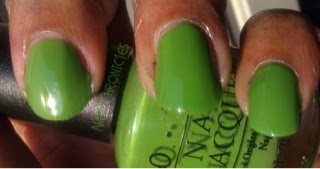 I immediately knew what I'd be layering this puppy over so here's OPI's Green-wich Village (which I picked up in my Ulta discount bin for the low low) Greenwich Village is a pretty creme that I've tried right in time for St. Patty's day. This is 2 coats GV. I also layered Show me the Money over China Glaze's Sunshine Pop (pinky), Sinful Colors HD Nails (ring finger), and Kleancolor's Black (middle finger).